Thank you for your interest in supporting the Johns Hopkins Carey Business School. Your investment helps us provide the best education for tomorrow's business leaders. By contributing to the education of deserving students through this fund, you can ensure that the next generation of business leaders achieves their full potential and chooses their own path to best improve the world. The Carey Business School find is the driving force behind the school's ability to innovate and excel in an increasingly competitive marketplace. The rerestricted support the fund provides plays a critical role in maintaining the school's stature as a global leader in graduate business education. The Carey Business School has a history of educating students connected to the military. While the GI Bill and the Yellow Ribbon program offer some support to our veterans, many of our active duty and some of our veterans need additional funding. This fund will provide support to those individuals who have served their country and wish to complete their graduate business school degree. We believe that a diverse school is positioned best to lead a diverse society. This fund supports the school's efforts to attract, retain and mentor underrepresented minority students. 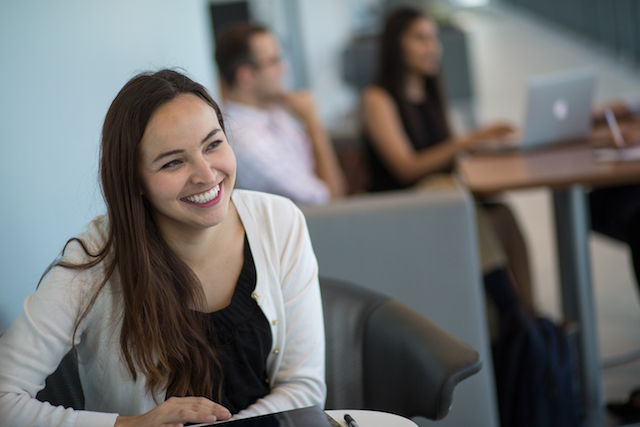 The Carey Business School is focused on delivering an outstanding student experience. From case competitions and career treks across the globe to student-led conferences that tackle the vexing business topics of the day, Carey encourages its students to be leaders. This fund supports initiatives, events, and opportunities that provide Carey students with real-world, practical experiences. Questions? Contact the Development and Alumni Relations team by email or at 410-234-9350 for more information. Did you know that nearly 50% of students at the Johns Hopkins Carey Business School are women? Shelby Schemerhorn, GMBA 2018, shares how the equal representation of women drove her decision to come to the Carey Business School.